Scones are one of my favourite treats and something my mum always had baking in the oven just about every week when I was growing up. Today is Mothering Sunday or what you call Mother’s Day here in Canada. My mum has already had her day at the end of April back home in the UK. I keep saying to my husband I should get two Mother’s Day celebrations but he just laughs at me. That’s fine, I don’t need a special day to know my family loves me. 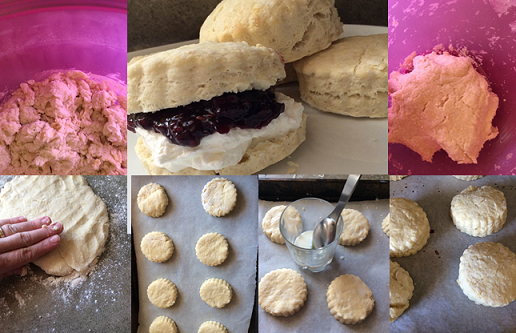 Today I am going to share with you my mum’s fluffy scones recipe. I loved these English scones as a kid although we would always have to wait until they cooled before eating them with homemade jam. She would make individual scones or a big round scone that could be sliced into big triangles. It was a big bake that day if she was making scones it meant that somebody was visiting and she would be making pancakes and shortbread too. Needless to say I learned lots about baking from my mum because I was always willing to help her out in the kitchen. My mum has the best scones recipe and if you want something quick to make that everyone will love, this is your recipe. Scones are pretty easy to make and rise slightly but just don’t over handle them as you will let the air out. The key to keeping them moist and fluffy is not to love them too much. The more you play around with the dough the less fluffy they will be. I always sieve my flour even if it says you don’t have to on the bag of flour. I like to make sure that it’s done so the best way is to do it myself. This way I know the scones are going to be light and fluffy. I am serving my scones today with homemade whipped cream and any jam which is pretty traditional if you go for a high tea in the UK. I actually made the blackberry and apple jam to go along with these beauties that you see in the photo. If you don’t fancy plain scones you can easily turn these into blueberry scones, cheese scones, lemon scones or lemon-filled scones with cream. Some of our family favourite scones have been cherry scones, raisin scones or a spicy jalapeno scone. Sometimes I like to sneak in a bit of cayenne pepper too. A high tea is usually served around three o’clock in the afternoon so I’ll be enjoying one or maybe two when the clock strikes 3. With the freshly baked scones proper English Tea would be served alongside cucumber sandwiches (with the crust us off of course), salmon sandwiches, pancakes, shortbread, and cream meringues. This was a highlight of a Sunday afternoon if my grandparents took us out as it was pretty fancy and I loved to indulge in my favourites. You don’t have to go to the UK to enjoy a proper high tea so today rather you can make it at home. I hope you take some time to create these scones in your kitchen to serve for your family. 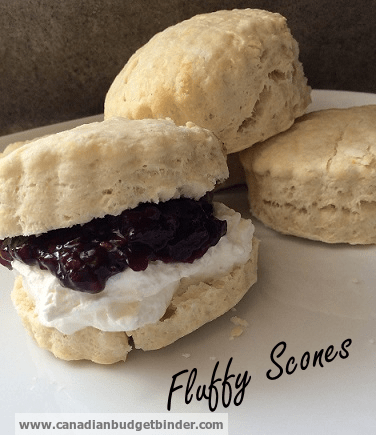 If you love scones you will enjoy these fluffy scones that you can fill with any preserve you like and cream. If you like to enjoy scones warmed with butter these are delightful with a hot beverage. Enjoy. Sieve flour, salt and baking soda into a large bowl. Mix using a knife for less handling of the dough as to keep it light and fluffy. Using your hands pat down the dough until you have a round of 2" in depth. Now you can either place this on parchment paper as is and have it as a round scone or cut out using a round cookie cutter or even using a knife and cut into squares. These are fairly easy scones to make so I hope you enjoy them as much as my family does. Don’t be shy with the filling either, load up on jam and cream and indulge in something sweet. I know I will. Yes the instant packs are very expensive and if you make up a big batch of the dry mix you only then need to use 2 cups of it and add the wet ingredients for your own instant mix! These scones are very easy and I usually find I have to double up on my ingredients as the kids love these too lol. I am sure your daughter will love making these too! Last Sunday, we just made our very own pancakes, thanks to your recipe! Usually we just bought an instant pancake and it’s quite expensive and it’s only good for 2 person. I should try this one too, I’m sure my daughter would definitely love this one!